LG have been showing off a Verizon Revolution that runs a virtual Android machine. So what? So, that means you can run a work phone as a virtual device on your personal phone — and junk your crappy second handset. Just like running a remote desktop on your personal computer when you need to work from home, LG has decided that the time — and the technology — has come to do the same with your phone, reports The Verge from CES. 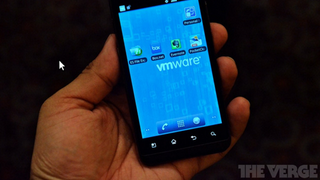 Running a VMware virtual Android machine, LG's Verizon Revolution allows users to run their own smartphone, then click over to a totally sandboxed "work" phone that's managed by an employer.